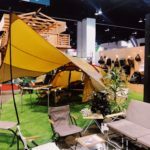 In late January we ventured to Colorado to attend Outdoor Retailer, get the scoop on what’s new in the industry and bring you a RVers Guide to The Country’s Biggest Outdoor Event. While in the Mile High City we explored the place known for its adventure culture and my, did we find inspiration! 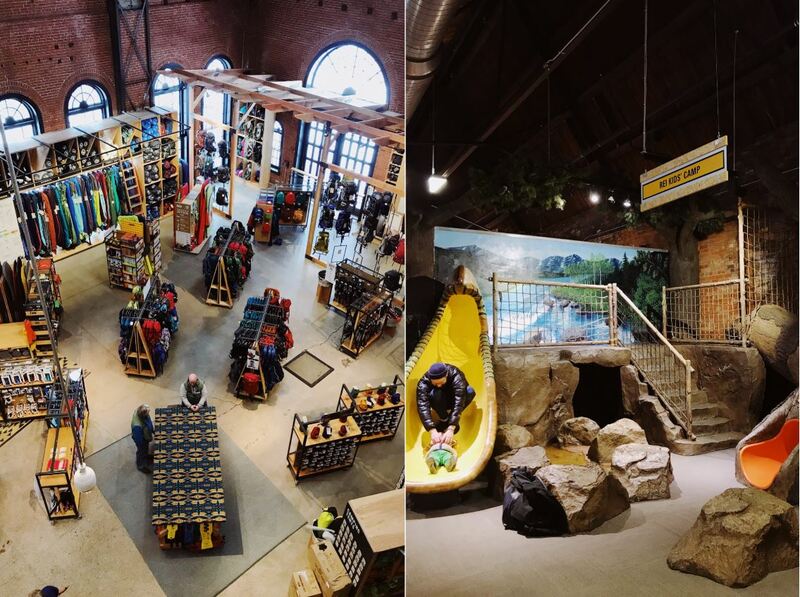 Today we’re bringing you an insider look at the coolest outdoor concept/flagship shops and the groundbreaking products that are lining their shelves in 2019. If you are an adventurous RVer, this one’s for you. 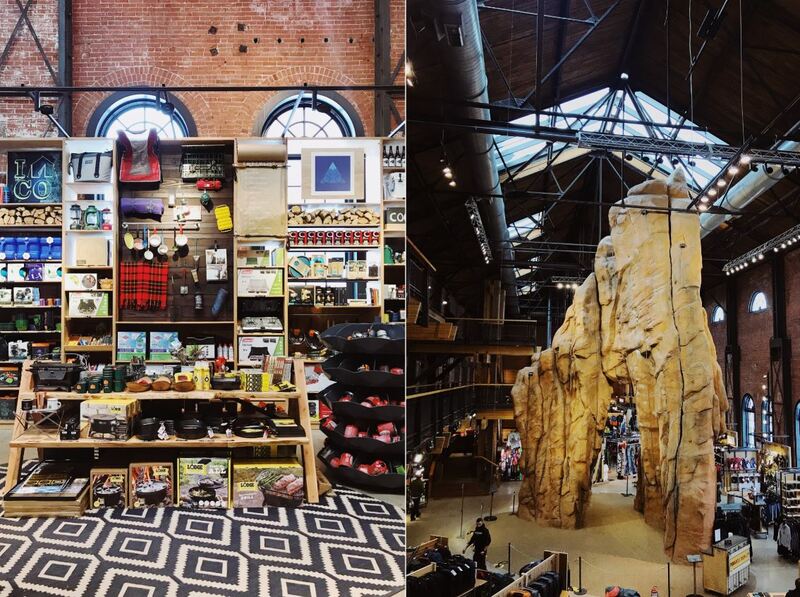 REI is a RVers dream for outdoor recreation gear. 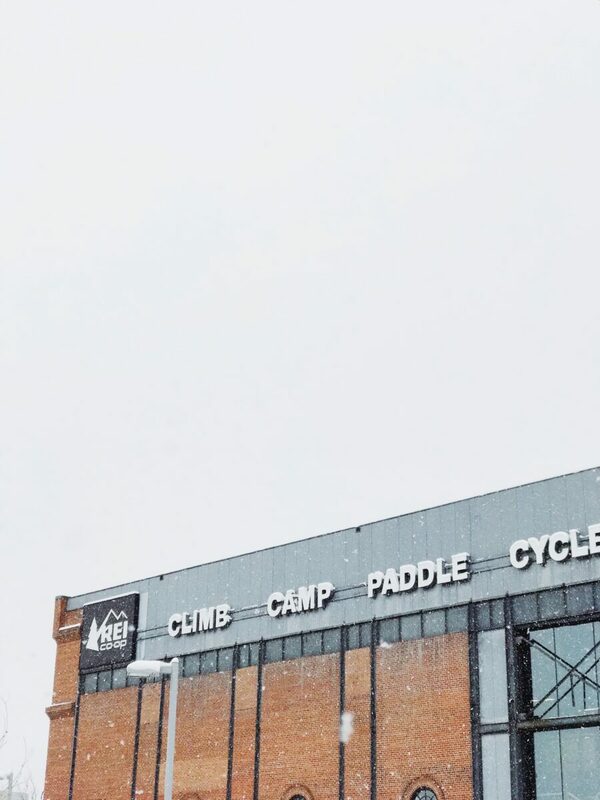 From camping, climbing, cycling, snow sports, travel and hiking, if it’s been made for the outdoors, you’ll find it at REI. The flagship store also features reading material on every outdoor subject from environmental conservation to travel novels, topographical charts and is equipped with numerous sitting areas for you to relax and read or plan out your next RV destination. Details: This light and portable recharger is ideal for powering your camera, tablet and other small devices while you’re boondocking. The recharger performs on the go, no matter the elements and has a five-star review by customers. Keep it in your day pack or by your nightstand in the evening so you can charge your electronics any time of day. Details: This headlamp comes in four different color options and boasts a long burn time, making it our go to headlamp for those late nights we roll into the campground and need to hookup our RV in the dark. This no frills equipment is necessary for those RVers who also enjoy night hiking or the early bird who likes to pack up and hit the road before dawn. Details: This less than 5 oz. pocket-size wash bag is ideal for the RVer who likes to get dirty. If you have little ones, dogs or are an adventure hiker that isn’t afraid of the elements, we highly recommend this product. Don’t wait for the next campground with a washer and dryer, the scrubba wash bag allows you to wash your clothes wherever, whenever. Made from microbial and hydrolysis-resistant polyether thermoplastic polyurethane, you’ll receive a machine-quality wash every time. Bonus, it doubles as a dryer! 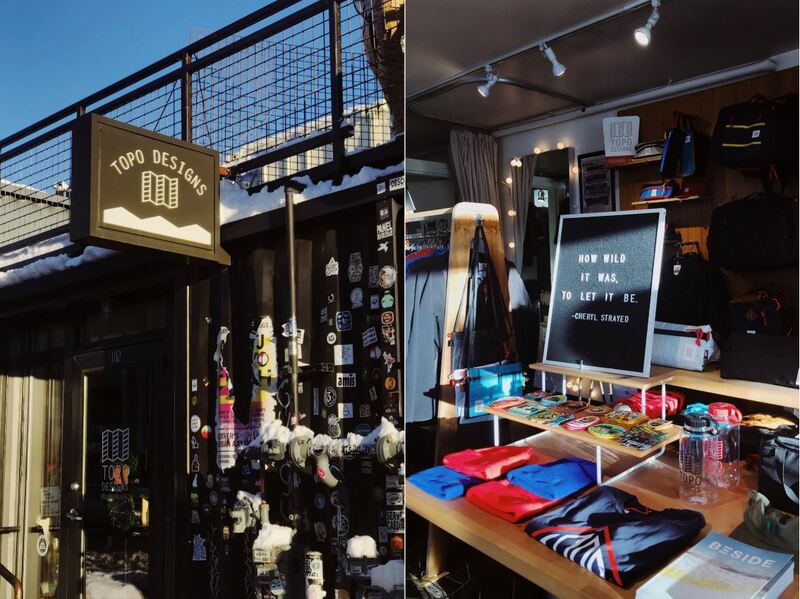 Check out Topo Designs flagship store and stay for a while. This intimate space is packed with high-design, colorful, USA-made outdoor gear and apparel, ideal for the RVer who loves style and color pop. The gear at Topo is excellent for ages 2 – 102. The color patterns of their duffles, backpacks, weekender bag, camera packs, hiking and work bags are so unique that you’ll be the envy of every RVer on the campground. Details: This item has just been released and is already flying off the shelf. The Escape Travel Bag Kit offers a modular travel system that includes a carry-all bag that is compact yet can fit everything from your clothes to your laptop. It also includes their bestselling Dopp Kit to hold your toiletries and three accessory bags. The micro is great for headphones, batteries, cash, the small for holding charging cables and RV keys and the medium for larger cables, cameras, medicines, and so forth. Details: These mugs are ideal for RV-to-trail. The 12 oz. stainless stell mug has Thermo 3D double wall vacuum insulation that will keep your early morning coffee warm and your campfire whiskey cold. The press on lid prevents splashing and is BPA free. Each purchase helps fund clean water and health projects for community’s around the world. Now that’s something we can get behind! Everyone loves a good deal. Keeping a budget while living on the road can be difficult, especially when snow sports are introduced. 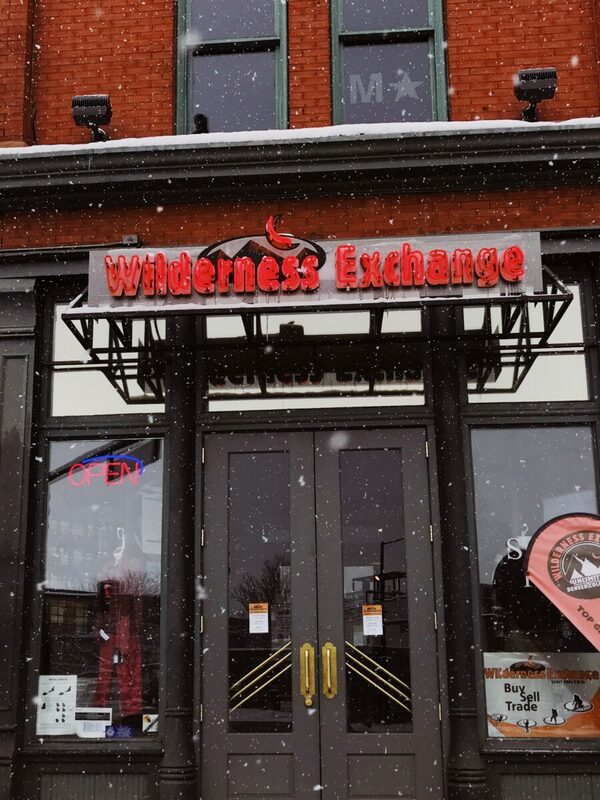 Enter Wilderness Exchange. This store, who’s motto is ‘Top Gear, Bottom Dollar’ features new and lightly used outdoor gear in every outdoor sports category. From rock and ice climbing to mountaineering, backcountry and cross-country skiing and everything in between, you will find significant savings on pristine equipment. You’ll also find amazing deals on camping and hiking gear as well as sunglasses, clothing and so much more. Details: The Osprey hydration pack is equipped with a removable tool pouch, LidLock helmet attachment, front zipper stash pocket with heat embossed scratch free lining, dual zippered hip belt pockets, atilon foam frame-sheet that allows dynamic body movement and a blinker light attachment point as well as reflective patches for nighttime visibility! Not to mention, it holds 10L of water and only weights 1.41 pounds. Details: These are the lightest and some would argue comfiest slippers on Earth that weigh a shocking 3 ounces a pair! Made with high-loft goose down for insulation, these booties are unbelievably useful on those cold boondocking mornings or when you’re backcountry camping. The simple elastic draw closure above the ankle keeps the cold air out while your feet remain nice and toasty. Are you looking for a last minute getaway adventure for Valentine’s Day? Check out our list of the Most Romantic Hot Springs to Venture to On This Day of Love and be sure to let us know where you end up going in the comment section below! 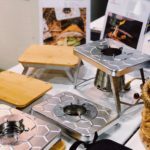 Hey Buddy!, I found this information for you: "For the RVer: These Denver Outdoor Concept Stores Have the Most Innovative Products". Here is the website link: https://experiencelife.lamesarv.com/2019/02/for-the-rver-these-outdoor-concept-stores-have-the-most-innovative-products/. Thank you.